Well, that's it then. The second season of "American Horror Story" ended last night with more of a fizzle than a bang, but it had a few ups and downs along the way. The story wasn't really as good as the first season except that this time the horror level was increased to way beyond what anyone expected. Severed limbs and blood abounded amidst all the confusion of tortured nutters, space aliens, mutated genetic experiments, demonic possessions, and more than a little bit of perverted sexiness. As before, Jessica Lange stole the show by adding so many layers to Sister Jude that she made Constance look flat in comparison. I'm sure she'll get another Golden Globe or Emmy nomination even if she doesn't win this time. With everybody acting their hearts out, the entire cast of "American Horror Story: Asylum" deserves an award. 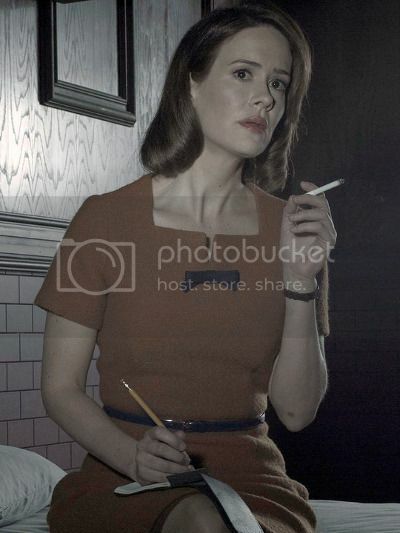 I absolutely loved Sarah Paulson as Lana Winters who proved herself to be not only one of the most beautiful but also one of the best actresses on TV. Even when dressed to look her dowdiest and dirtiest, she was still hot enough to drive the chills from my freezing cold living room. At the end of the day, this was all Lana's story with everything else as little more than padding. Another standout for me was, of course, Lily Rabe as Sister Mary Eunice who looked a lot better as a nun than she did as Nora in the first season. The red lipstick scene and seduction of Monsignor Timothy (Joseph Fiennes) were two of her most memorable moments. She even outshone Chloë Sevigny (aka the girl from "The Brown Bunny") who provided the most pathos. It's impossible to fault any of the acting except maybe a couple of slipped Boston accents from Evan Peters and Jessica Lange which were oddly jarring even to British ears. They seemed to improve as the series went on but remained forced nonetheless. The only big problems with this season were that too much was crammed in and there were several places where the story either dragged or went into areas that didn't particularly interest me (or anyone else according to various message boards). The stuff with Frances Conroy as the angel of death was mostly superfluous, the demonic possession of Sister Mary Eunice went nowhere, and the whole alien abduction thing also tried really hard to ruin everything. Against my better judgement, I kind of enjoyed the musical interlude with "The Name Game" song, but it was also still ridiculous. Overall, I liked the series, especially as it was far more entertaining than any of last year's horror movies (or any other movies for that matter), but it's not something which I would ever buy on DVD. Episodic television has its place in my viewing schedule but not in my collection. For those of you who haven't already recorded, downloaded or pirated your own copies, "American Horror Story: Asylum" will be released on Blu-ray and DVD on September 24th, 2013 so you can enjoy the madness all over again.